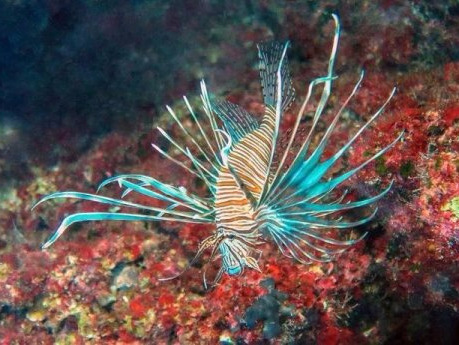 The Mediterranean is being invaded by a new alien species: the lionfish. According to a new study, published in Marine Biodiversity Records, these beautiful but venomous fish have colonised the south eastern coastline of Cyprus in just a single year, and their numbers are expected to grow. The study authors believe that the warming sea temperatures of the Mediterranean Sea and the 2015 expansion of the Suez canal may be allowing the lionfish to expand their range. A wider and deeper canal makes it easier for lionfish larvae and swimming adults to gain access to the Mediterranean waters. An infestation of lionfish could be a disaster for the local Mediterranean ecosystem. Originally from the Pacific and Indian oceans, these creatures are notorious invaders, having already rapidly spread throughout the Caribbean and Western Atlantic. It is believed that the animals first appeared in the Atlantic near South Florida in the 1980s after being dumped from home aquariums and then they quickly grew into an established invasive species by the 2000s. These non-native fish have very few predators, thanks to their long, poisonous spines. Even humans have to be careful around these fish because their sting is extremely painful and can cause paralysis, cardiac arrest and, occasionally, death by anaphylactic shock. With no natural predators, lionfish reproduce at an alarmingly fast pace, reports The Independent. They spawn every four days, all year round. Each female can produce about 2 million eggs in a year. These prolific invaders have also demonstrated that they are highly adaptable, able to thrive in a range of water temperatures, depths and salinity levels, according to LiveScience. The invasion of these fish is particularly worrisome because they tend to eat their way through the food chain, devouring all kinds of local fish and crustaceans. As active top predators, according to the US National Oceanic and Atmospheric Administration (NOAA), lionfish consume over 50 species of fish, including not only some ecologically important species, such as reef fish, but also certain species that are economically important. For example, these fish are known to feed on the young of snapper and grouper, both important commercial fish species. Their presence can have devastating consequences on the local fishing economy as a result. Maria PapinikolaA lionfish photographed in the Mediterranean. This is why scientists and fishermen have teamed up in the Western Atlantic to try to slow down the lionfish invasion. The Florida Fish and Wildlife Conservation Commission has even created a number of initiatives and opportunities for divers, anglers, and commercial harvesters to remove and kill as many lionfish as possible in seasonal competitions and year-round events. pufferfish, has disrupted food chains and replaced native species, threatening local biodiversity in the Mediterranean, reports LiveScience. 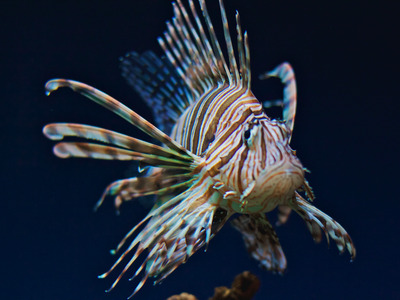 Without action, lionfish might be next. “By publishing this information, we can help stakeholders plan mitigating action,” Jason Hall Spencer, study author and professor at Plymouth University, told the Independent. He suggests that removal programs like those in Florida be implemented, as well as the restoration of populations of dusky groupers, a potential predator.